Been diving in Blue Heron Bridge? Please Vote! At first, I thought perhaps the only reason I’d found Blue Heron Bridge so special was because it was my first tropical experience after my certification dives in the murky, freezing waters of New York. But time and time again, Blue Heron proved it was not just a fluke—sure enough, it’s consistently named one of the best shore dives in the country. A muck dive without the muck, the pillars and sandy bottom beneath the bridge host an array of weird critters. Each dive I would find something different. Some days it was red-lipped batfish propped awkwardly on their front “legs.“ Others, tiny seahorses clinging to anything they could wrap their tails around, or their cousins, pipefish, hiding amongst the weeds. Spotted eels, stonefish, frogfish, and an assortment of crabs and shrimp ensure you’re never bored, while schooling grunts, barracuda, and blue-spotted stingrays keep non-macro divers entertained. A whale shark has even been spotted here. With so much life, night dives are particularly special. This is when squid become your silent companions beneath the bridge, chasing the torchlight. 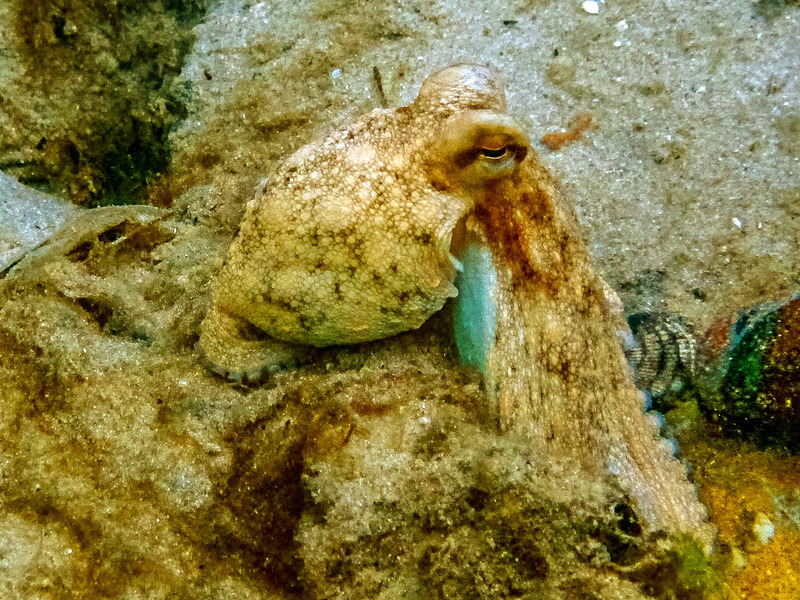 Octopuses are also common nighttime finds, their dens marked by a pile of empty shells. On one dive, I lost count at 20. With its constant surprises, Blue Heron became a staple of my Florida diving career. The Author: Kaelyn Lynch is a divemaster with experience guiding in the United States. One of the best shore dive in the USA and probably in the world. Map of Florida Keys, Blue Heron Bridge dive site.